The following posts are taken from the official blog for the spokesperson of the Israeli Defense Forces. Together, they are representative of the evolving attempts by the Israeli government to regain control of media coverage of the IDF’s attack on aid vessels attempting to reach the Gaza Strip. The posts are presented in order of occurrence. The Israeli Navy addresses a ship nearing the Gaza shore, offering it to dock at the Ashdod Port and transfer its supplies under the ship’s crew’s supervision. The ship refused to comply. According to reports from sea, on board the flotilla that was attempting to break the maritime closure on the Gaza Strip, IDF forces apprehended two violent activists holding pistols. The violent activists took these pistols from IDF forces and apparently opened fire on the soldiers as evident by the empty pistol magazines. Early this morning, IDF Naval Forces boarded six ships attempting to break the maritime closure of the Gaza Strip. This happened after numerous warnings from Israel and the Israeli Navy that were issued prior to the action. The Israel Navy requested the ships to redirect toward Ashdod where they would be able to unload their aid supplies which would then be transferred over land after undergoing security inspections.According to initial reports, these events resulted in the deaths of nine demonstrators and seven naval personnel were injured, some from gunfire and some from various other weapons. Two of the soldiers are moderately wounded and the remainder sustained light injuries. All of the injured, Israelis and foreigners have been evacuated by helicopter to hospitals in Israel.According to initial reports, these events resulted in the deaths of nine demonstrators and seven naval personnel were injured, some from gunfire and some from various other weapons. Two of the soldiers are moderately wounded and the remainder sustained light injuries. All of the injured, Israelis and foreigners have been evacuated by helicopter to hospitals in Israel. The following is a summary of the number of injuries and casualties in today’s incident in which IDF naval forces were met with extremely violent resistance on board the Mavi Marmara. According to the most recent reports, a total of seven soldiers were wounded – four soldiers were moderately wounded, of which two were initially in critical condition, as well as an additional three soldiers who were lightly wounded. Among the violent activists, there were nine casualties as a result of the soldiers defending themselves. It should be emphasized that both the State of Israel and the IDF made repeated calls to the flotilla, telling them that all goods and humanitarian aid could be transferred according to the secure and approved methods in place today, as is done on a near daily basis. Unfortunately, this was not the case. 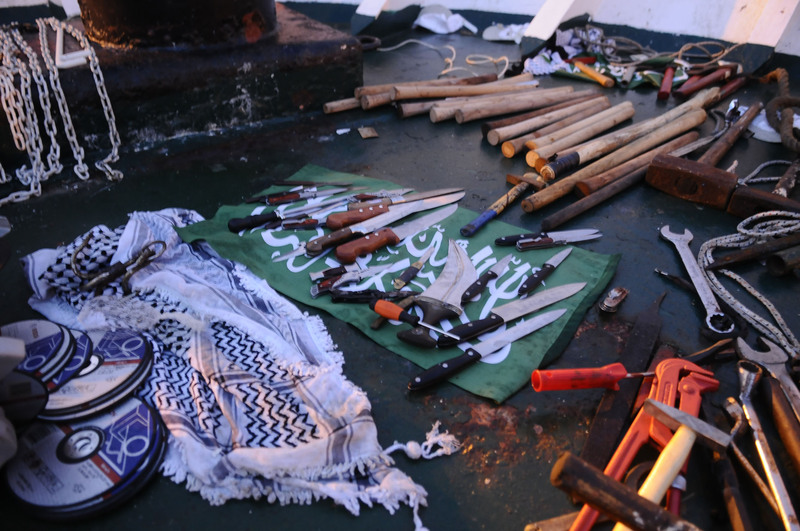 IDF naval forces were met with premeditated violence, evident by the activists’ use of clubs, metal rods, and knives, as well as the firing of two weapons stolen from the soldiers, causing for defensive action on behalf of the forces who felt their lives were endangered. For footage showing the violent actions taken by the activists, please browse our YouTube Channel at www.youtube.com/idfnadesk. According to initial reports, these events resulted in 9 deaths among the demonstrators and numerous injured, in addition, 7 naval personnel were injured, some from gunfire and some from various other weapons. Two of the soldiers are moderately wounded and the remainder sustained light injuries. All of the injured, Israelis and foreigners are currently being evacuated by helicopter to hospitals in Israel. An Israeli Navy Soldier describes the violent confrontation aboard the Mavi Marmara, detailing the descent of the soldiers onto the ship and the types of weapons used against them. Large groups of passengers surrounded soldiers and attacked them with metal poles and knives, and threw one soldier over the side of the ship. Some passengers grabbed pistols from the IDF soldiers and opened fire. As a result of the confrontation, seven IDF soldiers were injured, and nine of the passengers were killed. The ‘Free Gaza’ Flotilla had publicly insisted on their non-violent intentions, however their violent attack on the IDF soldiers was clearly premeditated. 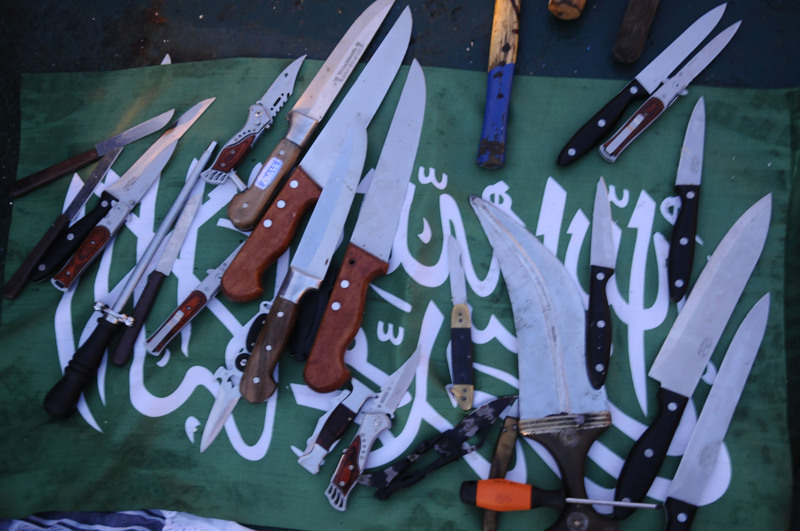 They had knives, metal rods, slingshots and other items ready to use.